When FBI K-9 agent Nina Atkins thwarts an attempted murder, she becomes a target of the killer - the same hit man US Marshal Thomas Grant is tracking. Even caught in the crosshairs, Nina's reluctant to share her case, but working with Thomas may be the only way to capture a murderer before she becomes his next victim. Determined to stop an arsonist with the help of his accelerant-detecting K-9 partner, FBI agent Tim Ramsey must protect the only witness. But when the criminal begins stalking Vickie Petrov, can Tim convince her to trust him...and help her survive to see another Christmas? 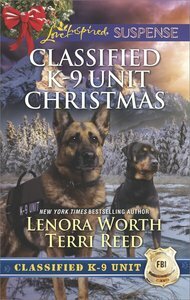 About "Killer Christmas, a / Yuletide Stalking (Classified K-9 Unit Christmas) (2in1 Love Inspired Suspence Series)"